On Monday, there was a package on my doorstep. It was a box and it was (astonishingly) NOT from Amazon. (The Fedex driver must have been mightily confused by that!) It was from my beloved sister. I knew it was coming. I had an inkling of what was in it, and opened the box with the expectation of seeing an old friend. 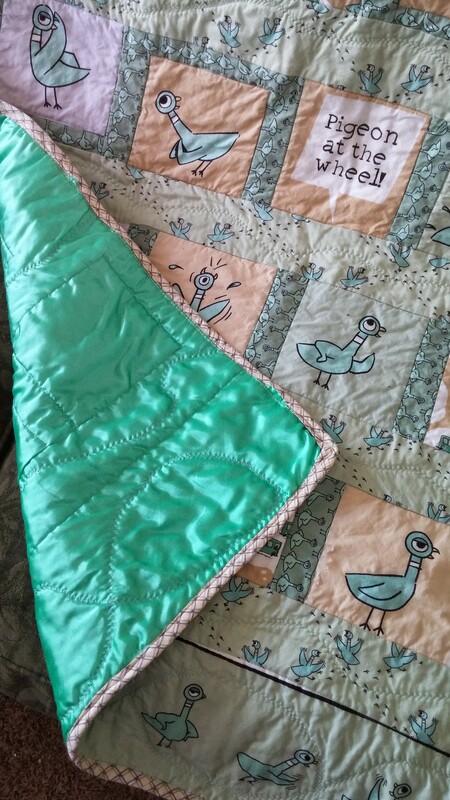 The tradition of quilting, and of giving a baby a quilt, is one my sister comes by honestly. My mother can sew well – I have a cloak of her making in the closet. But she was of the age where women were taught to sew because it had previously been practical… but where it ceased to be a survival skill for a well equipped woman. I’m sure my grandmother can sew too. But it was my great grandmother whose sewing I remember. I don’t remember when I got my quilt. It must have been after we got back from Africa – I doubt it crossed those oceans. Perhaps it was given to me when I lived in Merced. I can’t remember life without it. 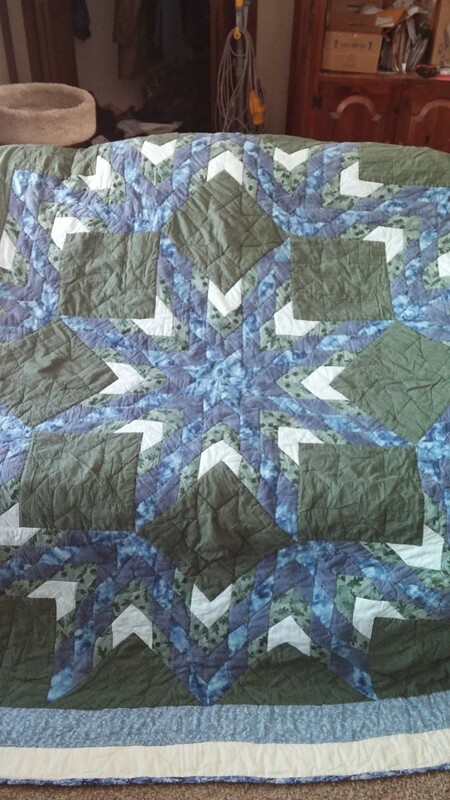 My great grandmother (Grandma Finley – my mother’s mother’s mother) made all three of us crazy quilts – my brother’s being made when she was north of 84 years old. My sister’s quilts are made with cotton fabric of a consistent weight. The fabrics are selected for color and pattern, and cut to create the design – then sewed back together. It’s an art form – a lovely one. But creating a quilt like that is certainly a cost. Fabric costs almost more in a fabric store than clothes do in a clothing store. 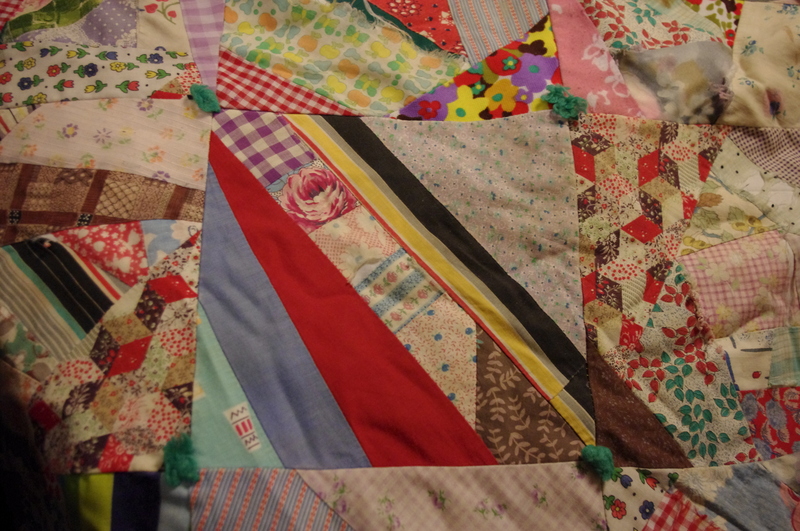 But the fabric on my crazy quilt was not purchased for its loveliness or pattern. What you see on my quilt are the dress shirts, worn out skirts, curtains, blouses, dresses, slacks and tablecloths all worn out past repair or reworking. My grandmother collected the fabric from worn out garments (and buttons – we had her button box for a long time and it was super fun to play with!) and then when a child was born she reached into that treasure trove and put together a quilt. I’m quite sure a few of those squares come from my mother’s childhood dresses. I have cuddled myself in the castoffs of my ancestors, put together to warm me by the thriftiest of them all. 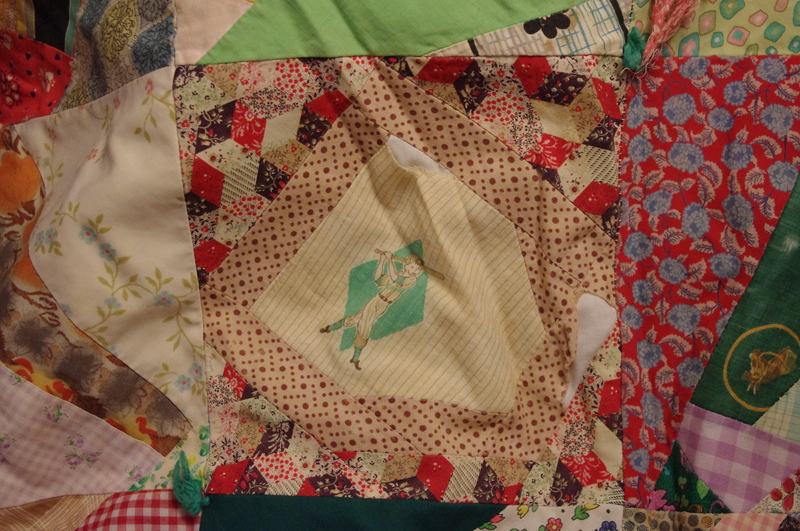 You can see how each quilt square was put together by different pieces of fabric – whatever would fit. There are no squares on my quilt made of a whole piece of fabric, although the same fabric will show up in multiple squares. Each of those tiny, tiny squares of fabric is sewn to its partners to create the block. What a labor of love. How long did she spend composing the squares – piecing them together like a puzzle? I can see the thoughtful look in her eyes – rimmed by old-fashioned golden spectacles – as she contemplated the pieces. (She had a tremendous sense of spatial reasoning. She was famous for being able to pick the perfect size tupperware for leftovers at a glance. She also cleaned our clocks regularly at Chinese Checkers. She died when I was in my late teens, so I knew her well.) And each of those seams is TINY. Not an 1/8th of an inch more fabric than was absolutely required for those seams was spent. The differences in the kinds of fabric (there are thick cotton fabrics, thin gingham pieces worn almost to the woof, synthetic fabrics – all manner of clothes) mean that those unforgiving seams have pulled apart in many places – unrepairable because there isn’t enough material to bridge the gaps. The different squares were then sewed each to the other. The actual quilting portion of the quilt was incredibly simple. 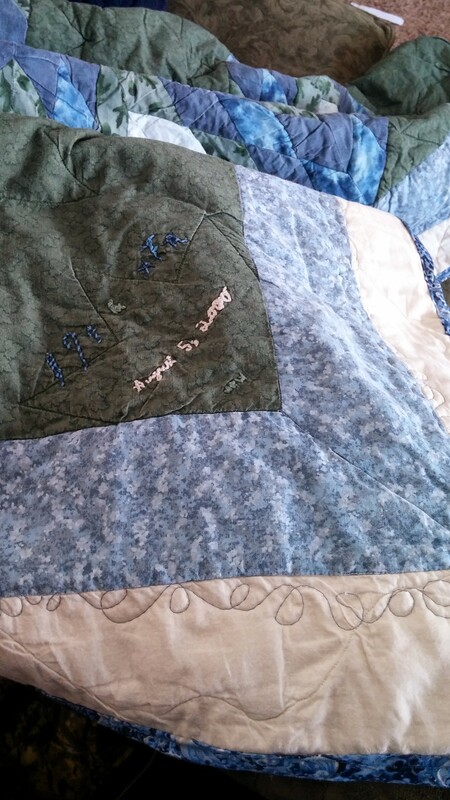 She sewed the filling and the back on at the edges, and then tied each quilt-square corner with a green yarn knot. I think this all meant that she could put together the entire quilt on her regular, workaday sewing machine – without any specialized machinery. Practical to the utmost. My home and my life overflow with good things. I have bags of perfectly good clothes and toys I’ll summon some charity to haul away for me. I never know what to do with the spare buttons that come with my clothes – my memories of her keep me from just throwing them away, but I might as well since I never repair any clothing. But perhaps, in her memory, wrapped in two generations worth of love-wrought quilts, I could consider myself pleased with what I have that is durable, of great value, and be content. I loved this post. It warmed me like your beautiful quilts. I adore the Pigeon quilt. My little-one loved those books in Preschool. You have a gift for story telling. 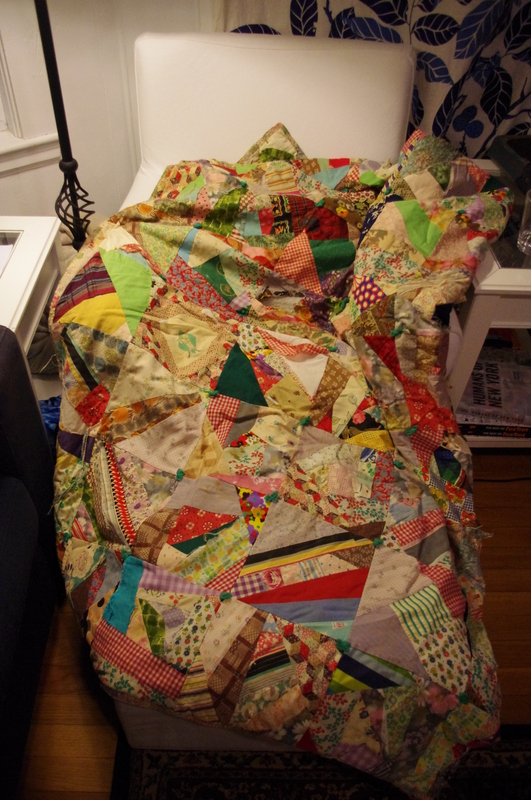 I wanted to snuggle on the couch right along with you and could easily imagine your great grandmother assembling each square of the crazy quilt. And I loved this line “My home and my life overflow with good things” Bravo. This is one of my favorite posts. Quilts have always been my favorite and most of my collection if not before will probably snuggle side by side with yours eventually. 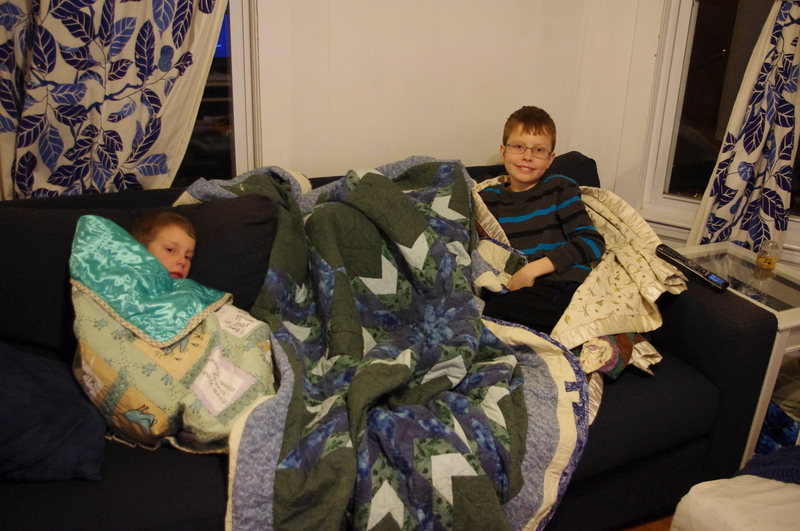 At this point in the winter, we’ve practically carpeted the house in blankets. Grey’s bed looks more like a nest! But I do love the quilts. My grandma was born in 1911. By the the time I knew her she and my grandpa were quite wealthy and didn’t want for anything. That’s why it struck me even more to see her one day taking all the leftover slivers of soap and running them together under hot water to melt them together into new bars. I think those things stay with you. It reminds me of my Mother’s Quilting Circle back in the late 60’s, early 70’s. they would meet in the church basement with all these looms and frames and stuff. I was usually the only child present, so I got a lot of attention and had all the kid stuff in the basement to play with. As we had sublet a portion of the basement and some of our huge upstairs area to a daycare that was only open during the week, there was a lot of stuff to mess with. Sadly, I do not have any of the quilts or afghans she made. It still brings back good memories!